FILE - Supporters of presidential front-runner Jair Bolsonaro exhibit a large, inflatable doll in his image as they march along Paulista Avenue in Sao Paulo, Brazil, Sept. 9, 2018. The front-runner in Brazil's presidential race says he wants to liberalize a largely closed economy, so why is he being called a "populist"? His speeches are laden with references to violence, but does such language deserve to be described as "far-right"? And is Jair Bolsonaro being "fascist" when he makes derogatory comments about blacks, Indians and gays? What about when he says political opponents should be shot or waxes nostalgic about the 1964-1985 dictatorship? As Sunday's election approaches, the seven-term congressman is the focus of fierce debate in Brazil and beyond over how to describe a candidate whose eclectic mix of policies and harsh language thrills supporters and terrifies detractors. Bolsonaro's rise parallels that of other politicians worldwide who often employ similar rhetoric, including U.S. President Donald Trump, Philippines President Rodrigo Duterte and several leaders across Europe. His opponent, Fernando Haddad, frequently says Bolsonaro is "extreme" and represents "a risk" to democracy. Haddad's Workers' Party has gone so far as to liken Bolsonaro to Adolf Hitler and the Nazi Party in campaign videos. "The press insists on calling him a right-wing populist," Jesus Silva Herzog Marquez, a political consultant in Mexico, recently wrote in his blog. "He is not. He is a fascist, and it's important to make the distinction." Bolsonaro "is not a fascist, but rather a pre-modern, conservative candidate from the 19th century," said Carlos Pereira, a political analyst with think-tank Getulio Vargas Foundation in Rio de Janeiro. "He never modernized." 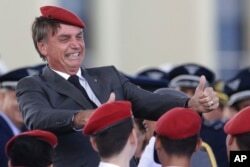 The debate comes in part because Bolsonaro's policy positions are sometimes at odds with his public statements and with the narrative that he pushes about himself: that he is a tough, no-frills former army captain ready to annihilate criminals and corrupt politicians for the good of the nation. Bolsonaro's rhetoric emphasizes "the people" against "the elite," words that encompass the most common definitions of the term. But experts note that what he has promised to do with the economy, the largest in Latin America, can hardly be called populist. Perhaps the biggest debates center around the terms "hard right," "far right" or "extreme right." The candidate himself takes issue with these descriptions. "I'm not on the extreme right. Show me an act that makes me extreme right," said Bolsonaro earlier this month during an event in Rio de Janeiro. He apparently believes the description arises from his past statements on immigration. Bolsonaro has called immigrants from several poor countries "scum of the world" and said during the same event that Brazil cannot become a "country of open borders." "I'm an admirer of President Trump. He wants America to be great. I want Brazil to be great," he added. French congresswoman Marine Le Pen, who is described by many news organizations, including The Associated Press, as "far-right," said the term does not apply to Bolsonaro. "I don't see Mr. Bolsonaro as an extreme-right candidate," she said during an interview with station French 2 this month. "He says unpleasant things that would be unacceptable in France. The cultures are different." But news organizations, academics and political consultants defend their use of the terms based on Bolsonaro's statements that range from a denigration of blacks, gays and indigenous peoples to assertions that Workers' Party stalwarts should be shot. Folha de S. Paulo, one of Brazil's leading daily newspapers, put the debate front and center earlier this month when it publicly debated a memo that had been sent to the newsroom that said Bolsonaro could be described as "right-wing" but not "extreme right." The terms "extreme left" or "extreme right" are "for groups that practice or preach violence as a political method," the memo said. Letters-to-the-editor criticizing and supporting the decision poured in, and the paper's ombudsman reviewed the issue. Her take: The newspaper was wrong in not calling Bolsonaro "extreme right." Folha and other mainstays of the Brazilian press "don't seem interested in the historical dimension of this understanding," she said. The most controversial term sometimes used to describe Bolsonaro and his campaign is "fascist," and its use goes beyond opponents or social media trolls. On Sunday, former President Fernando Henrique Cardoso said comments by one of Bolsonaro's sons, a congressman and close adviser, "smelled of fascism." Video surfaced of Eduardo Bolsonaro arguing during a talk in July that the country's top court could be shut down with just a few soldiers if for any reason his father was not allowed to assume office. Bolsonaro advocates for strong, even authoritarian leadership and exalts the state over the individual, central tenants of fascism. His campaign motto is: "Brazil above all, God above everybody." But people who argue that the term does not apply note that it's a huge leap to talk about Bolsonaro in the same category as Italian strongman Benito Mussolini, the first to use the term in the early 20th century, or Hitler, who oversaw the extermination of millions of Jews. "We need to stay alert in the future," wrote Helio Gurovitz, a prominent blogger for Brazilian G1 news portal. "But today the generalizing of terms of precise historic significance, such as 'fascism' or 'Nazism,' is a categorical error that only serves to nourish [Bolsonaro's] campaign and obscure the real risks he represents."